Annatto Dye or Lipstick Tree. Wong, Joseph. (2011). The tree Bixa orellana is a flowering perennial commonly known as the Lipstick Tree (other names include bixa, annatto, and achiote). It belongs to the family Bixaceae and ranges from three to ten meters in height. The lipstick tree is native to South and Central America but has been brought all over the world. 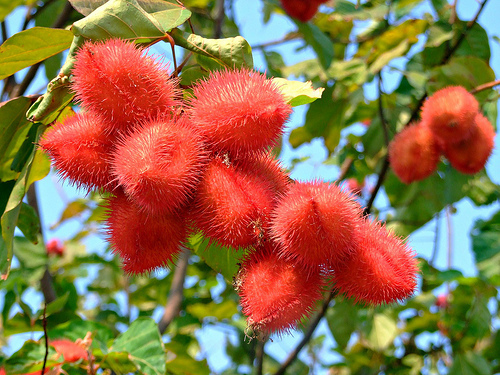 It has many unique uses most of which come from its vibrant red-orange seed known as annatto. The seeds can be utilized as a spice in many Latin American dishes and are also seen as dyes, makeups, and in medicines! There is an exquisite example of this tree in the UVM greenhouse which can be the perfect place to escape from the harsh Vermont winter, do some homework, or just enjoy being in the presence of such a unique tree.